A fourth top executive on Tuesday resigned from President Trump's manufacturing council in the wake of his handling of the violence and terror attack in Charlottesville last weekend. Scott Paul, the president of the Alliance for American Manufacturing, announced his decision in a tweet. On Monday night, the CEO of Intel, Brian Krzanich, announced that he resigned from the council because he wanted to call attention to "the serious harm our divided political climate is causing to critical issues, including the serious need to address the decline of American manufacturing." "I have already made clear my abhorrence at the recent hate-spawned violence in Charlottesville, and earlier today I called on all leaders to condemn the white supremacists and their ilk who marched and committed violence," Krzanich wrote in a blog post. "I resigned because I want to make progress, while many in Washington seem more concerned with attacking anyone who disagrees with them. We should honor – not attack – those who have stood up for equality and other cherished American values. I hope this will change, and I remain willing to serve when it does." The CEO of Under Armour, Kevin Plank, also left the council on Mondal, which he said he believed it was important for his company to have an active seat at the table and represent his industry. "We remain resolute in our potential and ability to improve American manufacturing. However, Under Armour engages in innovation and sports, not politics," he said. "I love our country and our company and will continue to focus my efforts on inspiring every person that they can do anything through the power of sport which promotes unity, diversity and inclusion." Mr. Trump dismissed their decisions to leave the council on Twitter Tuesday. 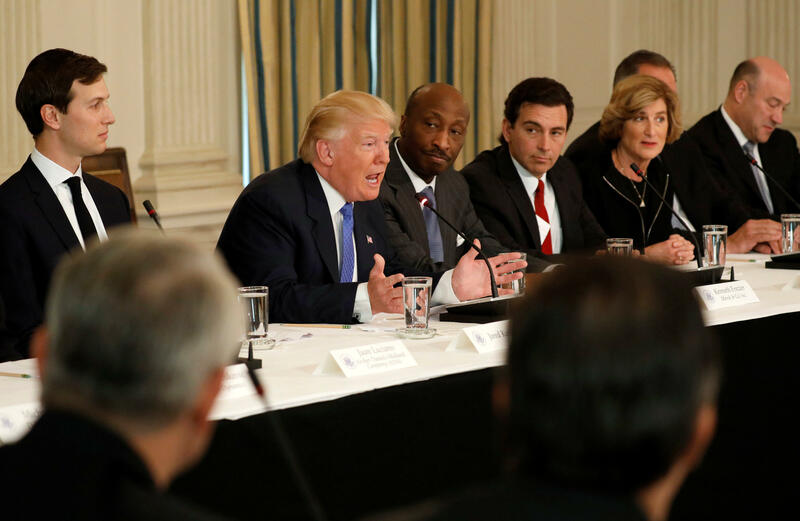 Kenneth Frazier, the CEO of Merck, was the first CEO to resign on Monday after way Mr. Trump responded to Charlottesville. That prompted the president to mock Frazier on Twitter in which he said Frazier will now have more time to "lower ripoff drug prices."